Commentary: God is describing here some of the awesome details of the “born-again” experience that true believers in His promised Messiah (Jesus Christ) will undergo (click HERE for details). Note that God says that He will “cause” them to obey His statutes and that they “will” keep His judgments. In other words, the born-again believer will obey, and continue to obey, God, because God will cause him to do so, not because they will choose, of their own volition, to do so. Surely God’s statutes and judgments include salvation (cf., John 6:39-40); thus, God himself will keep them saved. Commentary: Since Jesus will (not just can or may, but will) raise him up on the last day, he will not, even if he could, abandon his saving faith, deny Christ and forfeit his claim to eternal life with God in heaven. Commentary: Once you are saved, God himself works inside you to will to remain saved; that would certainly qualify as “His good pleasure”, would it not? Your will remains free to decide, but because your will is now realigned with God’s will, you have only one desirable choice and you’re “good” with that. So, “free will” becomes, in effect, a moot point, because you won’t ever want to abandon your saving faith, deny Christ and forfeit your inheritance of eternal life with God in heaven. Commentary: The Father’s will is that none (not some or most, but none) will be lost. Jesus will (not just can or may, but will) raise him up on the last day, because he will not abandon his saving faith, deny Christ and forfeit his inheritance of eternal life with God in heaven. Moreover, “everyone” whom God saves will stay saved, every one, and Jesus will raise all of them up on the Last Day…all of them. Commentary: Never means never, and nor means nor, period! All who are saved will persevere to the end. Commentary. Jesus is the one who “kept” the disciples saved while He was still alive in the world; they did not keep themselves saved. Here, Jesus asks the Father to keep them saved after He returns to heaven. So, who keeps us saved? Jesus’ Father, that’s who; we do not keep ourselves saved. Commentary: God is faithful, and He has promised (elsewhere) to keep you saved. He will do that by limiting the temptations that you may experience and providing a way of escape, if necessary. Thus, God will control the influences that might otherwise convince you to abandon your saving faith, deny Christ and forfeit your inheritance of eternal life with Him in heaven. Commentary: God himself will strengthen you until the day of our Lord (i.e., to the end), so that you will not abandon your saving faith, deny Christ and forfeit your inheritance of eternal life with God in heaven. Commentary: Simply put, the same God who saved you is the One who will also preserve (i.e., keep) you until the second coming of Jesus Christ. Commentary: This verse is often passed over lightly, without really seeing the full implication of it. Jesus is implying that, of those “who believed Him”, those who truly accepted the Gospel are the ones who will remain saved (i.e., “in My word”). In other words, a true disciple will remain a disciple, and those who do not remain in His word are not truly disciples of His, but only appear to be. A parallel point was made more explicitly by John himself in 1 John 2:19, next. Commentary: Here, John is speaking of “antichrists”, those who denied Christ and left the fellowship of true believers. These folks appeared to be true believers, but they showed that they were not by denying Christ and walking away. True believers, on the other hand, will not deny Christ and walk away. Commentary: This is a general truth, and Paul is applying it here to make the point that the Jews will, someday, also put their faith in the Messiah (Jesus) and be saved. Since this is a general truth, it also applies to the calling of all people to God and the gifts (i.e., grace, saving faith and salvation) given to them when they are converted; thus, salvation is not revocable, but permanent. Commentary: The God who saved you is the One who will keep you saved until the day of Jesus Christ (i.e., the end). God will finish what He started! Commentary: Paul says that there is no outside influence whatsoever that can take our salvation from us (separate us from the love of God, which is in Christ Jesus our Lord). But what about our misaligned will; can’t we use that to separate us? Paul said “No”, when he included “any other created thing” in the list, because we are created things! So, nothing and no one – not even we, ourselves – can cause ourselves to revoke our salvation. Besides, the will of the saved has been realigned to agree with the will of God, and there will no longer be any incentive to disobey God. Commentary: Taken together, these previous three passages say that the Holy Spirit, dwelling in every true believer, seals our salvation and guarantees that we will not lose it, ever, and certainly not by an act of our realigned will. Commentary: The power of God protects us, through faith, from denying Christ and losing our eternal inheritance. The God who saved us is the One who will keep us, by His power. Commentary: God is able to keep you from “falling” (i.e., denying Jesus and revoking your salvation). So, if God is able to keep you saved, then would He not, in fact, do it? After all, it is His will that you remain saved (John 6:39-40). God both saves you and keeps you saved. 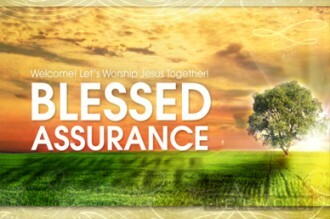 Genuine Assurance: So, which version of assurance offers absolute certainty for the true believer? If the saved person is able to renounce his faith in the divinity of Jesus and lose his salvation, then his is only a hope of assurance, a hope that is contingent upon his own power and strength to retain his saving faith. His eternal security is only as secure as his faith is. I liken this, somewhat, to a letter in the mail that says on the outside of the envelope, “Congratulations, you are the winner of $5,000 a week for life!” But, when you read the letter inside, it says “…if yours is the lucky number to be drawn soon.” You have to wait until the drawing to find out whether or not you have won, and you cannot guarantee that you will win anything! What kind of a God would go to such lengths and pay such a price to draw us and save us, only to leave it entirely up to us to keep ourselves saved? On the other hand, if, as the Bible says, the saved person is protected by the power of God and given the Holy Spirit as a guarantee that he will never renounce his faith in the divinity of Jesus and lose his salvation, then his is an absolute certainty – that is to say, real assurance – from the day of his salvation right on into eternity. His eternal security is as secure as God is faithful. Put another way, “Your faith will not fail while God sustains it; you are not strong enough to fall away while God is resolved to hold you.” (J.I Packer in “Knowing God”). Now, I don’t know about you, but I would much rather have God in charge of my assurance than me; He is far more trustworthy, faithful and able to keep me saved than I am! Benefits and Potential Pitfalls: I have found that a right understanding and acceptance of this doctrine of assurance confers true peace with God and guaranteed security in my right standing with Him from the moment God saves me right into eternity. Such peace and security are true blessings of immense value to the born again believer. But, this same doctrine can easily be misconstrued to, seemingly, give us license to sin all the more, because of God’s abounding grace (Romans 5:20). To this erroneous manner of (wrong) thinking the Apostle Paul declares emphatically, “God forbid!” (Romans 6:2, 15). How shall we who died to sin live any longer in it? And in Galatians 6:7-8, he issues this warning, “Be not deceived. God is not mocked. For whatever a man sows, that will he also reap. For the one who sows to his own flesh will from the flesh reap corruption, but the one who sows to the Spirit will from the Spirit reap eternal life.” The fact that this doctrine can be misunderstood and abused does not diminish, in any way, either its validity or its blessings to the one who understands and practices it rightly. This entry was posted in Biblical Teachings and tagged assurance, believe, Christ, eternal, faith, God, heaven, Holy Spirit, inheritance, Jesus, last day, Lord, salvation, save.